What Does The Queensland Smoke Alarm Legislation Mean For Me? We’ve had a lot of questions from clients recently about the law surrounding Queensland smoke alarm legislation so we thought we’d share the key facts. The Queensland Government passed new legislation that came into effect in January 2017. 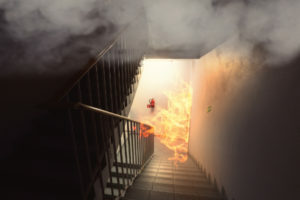 The new laws specify the type, positioning, and interconnectedness of smoke alarms for Queensland homes. Effectively you will be required to have photo electric interlinked smoke alarms installed in all bedrooms, living areas and hallways linking rooms on every level of your home. The key change here is that previously you could choose between installing photo electric smoke alarm or an ionisation device. The new law now prohibits the installation of the ionisation type of alarm. The other key change is the requirement for the hard wired photo electric smoke alarms to be interconnected. This means that if a smoke alarm in the hallway is triggered, the interlinked alarm in your bedrooms will also be activated. Smoke alarms will also have to be less than 10 years old. You can easily check this on the alarm itself by removing the cover panel. Houses built/renovated after 1 January 2017 have to comply with the new legislation. Queensland Fire & Emergency Services have produced a fact sheet outlining these definitions in a bit more detail. Make sure you are ready for the Queensland smoke alarm legislation. If you don’t yet have a photo electric smoke alarm installed at your property or you have one but would like to get the rest of your property adequately protected, now is the time to act. Our Brisbane electricians are available to undertake a smoke alarm installation at your property at your convenience. Give us a call today on 0414 751 299.